Of course, IBM didn’t wait until 2019. It purchased Red Hat Linux at the end of Oct. 2018. DancingDinosaur covered it here a few days later. At that time IBM Chairman Ginni Rometty called the acquisition of Red Hat a game-changer. “It changes everything about the cloud market,” she noted. At a cost of $34 billion, 10x Red Hat’s gross revenue, it had better be a game changer. Forrester continues, predicting that in 2019 the cloud will reach its more interesting young adult years, bringing innovative development services to enterprise apps rather than just serving up cheaper, temporary servers and storage, which is how it has primarily grown over the past decade. Who hasn’t turned to one or another cloud provider to augment its IT resources as needed, whether backup or server capacity, and network? As Forrester puts it: The six largest hyperscale cloud leaders — Alibaba, Amazon Web Services [AWS], Google, IBM, Microsoft Azure, and Oracle — will all grow larger in 2019, as service catalogs and global regions expand. Meanwhile, the global cloud computing market, including cloud platforms, business services, and SaaS, will exceed $200 billion in 2019, expanding at more than 20%, the research firm predicts. Hybrid clouds, which provide two or more cloud providers or platforms, are emerging as the preferred way for enterprises to go. Notes IBM: The digital economy is forcing organizations to a multi-cloud environment. Three of every four enterprises have already implemented more than one cloud. The growth of cloud portfolios in enterprises demands an agnostic cloud management platform — one that not only provides automation, provisioning and orchestration, but that also monitors trends and usage to prevent outages. Of course, IBM also offers a solution for this; the company’s Multicloud Manager runs on its IBM Cloud Private platform, which is based on Kubernetes container orchestration technology, described as an open-source approach for ‘wrapping’ apps in containers, and thereby making them easier and cheaper to manage across different cloud environments – from on-premises systems to the public cloud. Along with hybrid clouds containers are huge in Forrester’s view. Powered by cloud-native open source components and tools, companies will start rolling out their own digital application platforms that will span clouds, include serverless and event-driven services, and form the foundation for modernizing core business apps for the next decade, the researchers observed. Next year’s hottest trend, according to Forrester, will be making containers easier to deploy, secure, monitor, scale, and upgrade. “Enterprise-ready container platforms from Docker, IBM, Mesosphere, Pivotal, Rancher, Red Hat, VMware, and others are poised to grow rapidly,” the researchers noted. This may not be as straightforward as the researchers imply. Each organization must select for itself which private cloud strategy is most appropriate, they note. They anticipate greater private cloud structure emerging in 2019. It noted that organizations face three basic private cloud paths: building internally, using vSphere sprinkled with developer-focused tools and software-defined infrastructure; and having its cloud environment custom-built with converged or hyperconverged software stacks to minimize the tech burden. Or lastly, building its cloud infrastructure internally with OpenStack, relying on the hard work of its own tech-savvy team. Am sure there are any number of consultants, contractors, and vendors eager to step in and do this for you. If you aren’t sure, IBM is offering a number of free trials that you can play with. As Forrester puts it: Buckle up; for 2019 expect the cloud ride to accelerate. For DancingDinsosaur, this announcement: IBM and VMware Announce Strategic Partnership to Accelerate Enterprise Hybrid Cloud Adoption, was the most eyebrow raising. IBM and VMware have jointly designed an architecture and cloud offering that will enable customers to automatically provision pre-configured VMware SDDC environments, consisting of VMware vSphere, NSX and Virtual SAN on the IBM Cloud. With this SDDC environment in place, customers will be able to deploy workloads in this hybrid cloud environment without modification, due to common security and networking models based on VMware. This appears intended to encompass SoftLayer too as just another new application environment. Apple’s Swift development language adds more developer news: IBM to Bring Swift to the Cloud to Radically Simplify End-to-End Development of Apps. IBM has become the first cloud provider to enable the development of applications in native Swift, unlocking its full potential in radically simplifying the development of end-to-end apps on the IBM Cloud. This announcement is the next phase of its roadmap to bring Swift to the Cloud with a preview of a Swift runtime and a Swift Package Catalog to help enable developers to create apps for the enterprise. DancingDinosaur, a former wannabe developer, is a fan of Swift as well as node.js and Go. Where were all these nifty tools when I was younger? Watson is another longtime favorite of DancingDinosaur: IBM Announces New and Advanced Watson APIs on the Cloud. New and expanded cognitive APIs for developers that enhance Watson’s emotional and visual senses will further extend the capabilities of the industry’s largest and most diverse set of cognitive technologies and tools. IBM is also adding tooling capabilities and enhancing its SDKs (Node, Java, Python, and the newly introduced iOS Swift and Unity) across the Watson portfolio and adding Application Starter Kits to make it easy for developers to customize and build with Watson. All APIs are available through the IBM Watson Developer Cloud on Bluemix. And just in case you didn’t think these weren’t enterprise-class announcements: IBM and GitHub Form Strategic Partnership to Offer First GitHub Enterprise Service in Dedicated and Local Hybrid. IBM and GitHub plan to deliver GitHub Enterprise as a dedicated service on Bluemix to customers across private and hybrid cloud environments. By working with IBM Cloud, developers can expect to learn, code and work with GitHub’s collaborative development tools in a private, environment with robust security capabilities. GitHub and IBM, through this strategic partnership, aim to advance the development of next generation cloud applications for enterprise customers. IBM WebSphere Blockchain Connect – A new service available to all WebSphere clients is designed to provide a safe and encrypted passage from their blockchain cloud to their enterprise. Starting immediately, enterprises currently using IBM’s on-premises software can tap these new offerings as an on ramp to hybrid cloud, realizing immediate benefits and new value from their existing investments. Blockchain is just one part of a series of tools intended to make it easier for developers to unlock the valuable data, knowledge and transaction systems. Also coming is fully integrated DevOps tools for creating, deploying, running and monitoring Blockchain applications on IBM Cloud that enables the applications to be deployed on IBM z Systems. Blockchain still may be unfamiliar to many. Recognized most as the technology behind bitcoins, it should prove particularly valuable for IoT systems by providing a mechanism to securely track any of the various things. It enables what amounts to trustless transactions by eliminating the need for an intermediary between buyers and sellers or things and things. For those who want open trustworthy IoT communications without relying on intermediaries blockchain could provide the answer, facilitating the kind of IoT exchanges people have barely begun to imagine could be possible. Finally, IBM Unveils Fast, Open Alternative to Event-Driven Programming through the Bluemix OpenWhisk platform, which enables developers to quickly build and link microservices that execute software code in response to events such as mouse clicks or receipt of sensor data from an IOT device. Developers won’t to need worry about things like pre-provisioning infrastructure or operations. Instead, they can simply focus on code, dramatically speeding the process. 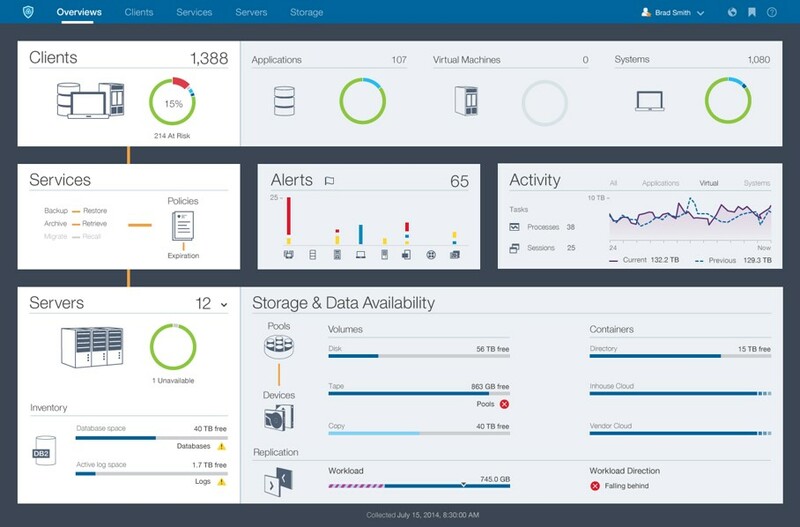 IBM is targeting storage for hybrid clouds with Spectrum Protect. Specifically, it brings new cloud backup and a new management dashboard aimed to help businesses back up data to on-premises object storage or the cloud without the expense of cloud-gateway appliances. It also enables advanced data placement across all storage types to maximize performance, availability, and cost efficiency. Spectrum Protect represents the latest part of the IBM Spectrum storage family; which provides advanced software defined storage (SDS) storage capabilities and flexible storage either as software, an appliance, or a cloud service. IBM announced Spectrum Protect at the end of August. Introduced early this year, IBM Spectrum brings a family of optimized SDS solutions designed to work together. It offers SDS file, object, and block storage with common management and a consistent user and administrator experience. Although it is based on IBM’s existing storage hardware products like XIV, Storwize, IBM FlashSystem, and SVC you can deploy it as software on some non IBM hardware too. It also offers support for VMware environments and includes VMware API support for VASA, VAAI, and VMware SRM. With Spectrum, IBM appears to have come up with a winner; over the last six months, IBM reports more than 1,000 new clients have chosen products from the IBM Spectrum Storage portfolio. Specifically, IBM Spectrum Protect supports IBM Cloud infrastructure today with plans to expand to other public clouds in future. IBM Spectrum Accelerate (XIV block storage) also can be accessed as a service by IBM Cloud customers via the SoftLayer cloud infrastructure. There it allows companies to deploy block storage on SoftLayer without having to buy new storage hardware or manage appliance farm. In competitive analysis, IBM found that a single IBM Spectrum Protect server performs the work of up to 15 CommVault servers. This means that large enterprises can consolidate backup servers to reduce cost and complexity while managing data growth from mobile, social, and Internet of Things environments. Furthermore, SMBs can eliminate the need for a slew of infrastructure devices, including additional backup servers, media servers, and deduplication appliances, thereby reducing complexity and cost. Cost analysis with several beta customers, reports IBM, indicates that the enhanced IBM Spectrum Protect software can help clients reduce backup infrastructure costs on average by up to 53 percent. IBM reports that the Spectrum Storage portfolio can centrally manage more than 300 different storage devices and yottabytes (yotta=1024 bytes) of data. Its device interoperability is the broadest in the industry – incorporating both IBM and non-IBM hardware and tape systems. IBM Spectrum Storage can help reduce storage costs up to 90 percent in certain environments by automatically moving data onto the most economical storage device – either from IBM or non-IBM flash, disk, and tape systems. IBM Spectrum Storage portfolio packages key storage software from conventional IBM storage products. These include IBM Spectrum Accelerate (IBM XIV), Spectrum Virtualize (IBM SAN Volume Controller along with IBM Storwize), Spectrum Scale (IBM General Parallel File System or GPFS technology, previously referred to as Elastic Storage), Spectrum Control (IBM Virtual Storage Center and IBM Storage Insights), Spectrum Protect (Tivoli Storage Manager family) and Spectrum Archive (various IBM tape backup products). The portfolio is presented as a software-only product and, presumably, you can run it on IBM and some non-IBM storage hardware if you chose. You will have to compare the cost of the software license with the cost of the IBM and non-IBM hardware to decide which gets you the best deal. It may turn out that running Spectrum Accelerate (XIV) on low cost, generic disks rather than buying a rack of XIV disk to go with it may be the lowest price. But keep in mind that the lowest cost generic disk may not meet your performance or reliability specifications. IBM reports it also is enhancing the software-only version of IBM Spectrum Accelerate to reduce costs by consolidating storage and compute resources on the same servers. In effect, IBM is making XIV software available with portable licensing across XIV systems, on- premises servers, and cloud environments to offer greater operational flexibility. Bottom line: Possibly a good deal but be prepared to do some detailed comparative cost analysis to identify the best mix of SDS, cloud storage, and hardware at the best price for your particular needs. Desktop virtualization, referred to as Virtual Desktop Interface (VDI), has long held great promise, and for specialized situations it has delivered big. For general enterprise desktop computing the need is great but the challenges are formidable and the payback is elusive. IDC has become bullish on VDI payback in the last year. You can see what it says about VDI here and here. In each case it comes up with a nice ROI. DancingDinosaur isn’t going to quibble with IDC, but in talking with very large enterprises they complain that they simply cannot virtualize enough desktops on each server. At best they end up replacing desktop sprawl with desktop server sprawl. An improvement no doubt, but not a big enough gain to undertake what would amount to a massive change management effort if, for instance, you needed to virtualize 40,000 desktops. Jim Porell, an IBMer familiar to System z people and now Distinguished Engineer, Deputy CTO, IBM Federal Sales, takes a different approach. Using an entry-level z114, a zBX populated with richly configured Hx5 blades, z/VM, and a handful of other components (Raytheon Trusted Computer Solutions’ Trusted Thin Client, CSL-WAVE to manage server instances with a GUI, Virtual Bridges’ VERDE to handle VDI images and provisioning, Intellinx’s zWatch for user activity monitoring, and Vicom Infinity for a variety of simplification software) as well as Tivoli and storage, Porell calculates he can deliver tens of thousands of virtualized desktops for as little as $600 per desktop depending on the mix of user workloads. The user workloads span from minimal browser web surfing to basic MS Office functionality to power users. This is the amortized cost of all the hardware (thin desktop client, z114, zBX, storage), middleware, software, and management across all desktops. Porell really is talking about a system dubbed Smart Terminal Architecture with Secure Hosts (STASH) and it has been attracting a bit of attention. You can find it here and here (scroll way down to get to the STASH Consortium link). IBM describes it as a new computing environment that offers military grade security from the desktop to the back end. STASH challenges the traditional assumption that greater security and increased performance utilization comes with increased costs. STASH is made up of a multi-functional team across IBM, Raytheon Trusted Computer Solutions, CSL International, Intellinx Software, Virtual Bridges and Vicom Infinity. STASH simplifies the IT environment and saves money while increasing security. What the zEnterprise brings to this endeavor is massive scalability, reliability, and security. Even the entry level z114 can easily handle dozens of management servers to support the desktops. The zBX packed with 16-core Hx5 blades can handle up to 16 x86 desktops (Windows or Linux) per core and with 28 16-core blades per zBX. When multiplied by four zBX machines per zEnterprise the number of desktops supported really adds up. Porell estimates between 14K and 28K desktops per zEnterprise server. And if VDI is a new z workload to your data center, which it almost surely would be, you could use the Solution Edition program to buy the z at a deep discount and pick up a zBX also at a discount, although not quite as deep. That should let you drive down the cost per desktop even more. VMware running View on even the beefiest Intel servers will have trouble matching the scalability, reliability, and security of the zEnterprise/zBX VDI solution with its various STASH piece parts. You would have to engineer in a lot of redundancy just to start. Porell, meanwhile, is talking with clients about deploying half a million virtual desktops or more using the STASH model. There are other issues to resolve around VDI mainly having to do with change management, though both CSL and Virtual Bridges work to address those problems. With STASH, zEnterprise shops have a good head start on delivering truly scalable, cost-efficient VDI. Even before the zEnterprise/zBX was introduced, most mainframe data centers were multi-platform, multi-OS shops. IBM had z/VM and Power VM as hypervisors for System z and Power systems, but in the x86 world VMware ESX ruled, followed by Microsoft’s Hyper-V. So, it was significant when IBM announced in early May that it and Red Hat, an open source technology leader, are working together to make products built around the Kernel-based Virtual Machine (KVM) open source technology for the enterprise. Jean Staten Healy, IBM’s Director of Worldwide Cross-IBM Linux, told IT industry analysts that the two companies together are committed to driving adoption of the open source virtualization technology through joint development projects and enablement of the KVM ecosystem. DancingDinosaur touched on aspects of this several weeks ago, here. Differentiating the KVM approach from those taken by the current x86 virtualization leaders is open source technology. An open source approach to virtualization, Healy noted, lowers costs, enables greater interoperability, and increases options through multiple sources. The KVM open source hypervisor allows a business to create multiple virtual versions of Linux and Windows environments on the same server. Companies can take KVM-based products and combine them with comprehensive management capabilities to create highly scalable and reliable, fully cloud-capable systems that enable the consolidation and sharing of massive numbers of virtualized applications and servers. Red Hat Enterprise Virtualization (RHEV), for example, was designed for such large scale datacenter virtualization by combining its centralized virtualization management capabilities and advanced features with the KVM hypervisor. BottomlineIT looked at the Red Hat open source approach to virtualization a few weeks ago. The open source approach to virtualization is starting to gain traction. To that end Red Hat, IBM, BMC, HP, Intel, and others joined to form the Open Virtualization Alliance. Its goal is to facilitate the adoption of open virtualization technologies, especially KVM. It intends do this by promoting examples of customer successes, encourage interoperability, and accelerate the expansion of the ecosystem of third party solutions around KVM. A growing and robust ecosystem around KVM is essential if the open source hypervisor is to effectively rival VMware and Microsoft. zEnterprise—IBM’s own Processor Resource/System Manage (PR/SM) type 1 hypervisor and its related z/VM operating system (which can function as a type 2 hypervisor) will continue to direct resource activity on the zEnterprise 196. PowerVM—a hypervisor that divides Power systems and blades into logical slices to virtualize I/O as well as to support AIX continues with IBM’s Power platforms. IBM’s System x—Xeon blades will use a version of KVM that works with System z firmware. The hypervisors on the Power and Xeon blades are treated like other system firmware on the mainframe. Not only do PR/SM, PowerVM, and RHEV get treated like firmware on the z but are linked back to the zEnterprise and the Unified Resource Manager via a built-in Gigabit Ethernet network implemented in a switch in the z. Result: The switch hooks into the Advanced Management Module in the BladeCenter chassis, while the Unified Resource Manager uses SNMP to manage the BladeCenter and zBX hardware and has hooks into the PowerVM and KVM hypervisors to manage virtual machine partitions on the Power and Xeon blades. For IBM the KVM technology is particularly well suited to address cloud challenges. It provides a predictable and familiar environment, auditable security compliance, and an open source licensing model that keeps costs down while requiring no additional skills. This makes it particularly cost-effective for large-scale cloud use, public or private, which is where IBM sees all this virtualization taking enterprises. IBM further embraced open source last week at Red Hat’s user conference in Boston around virtualization and cloud initiatives. The relationship, however, has been growing for over a decade as Red Hat Enterprise Linux (RHEL) becomes increasingly popular on the System z. The arrival of x and Power blades for the zBX should only increase the presence of RHEL on the System z. Last year IBM selected Red Hat Enterprise Virtualization (RHEV) as a platform option for its development and test cloud service. Dev and test has emerged as a natural for cloud computing given its demands for quick setup and take down. Although there weren’t any major specific System z announcements almost all System z shops run a mix of platforms, including System x for Linux and Windows, the Power platform for AIX and Linux, and are making forays into private, public, and hybrid clouds. So there was plenty coming out of the conference that will interest mainframe shops even if it wasn’t System z-specific. First, open virtualization based on Red Hat’s open source KVM hypervisor. This enables an organization to create multiple virtual versions of Linux and Windows environments on the same server. This will help save money through the consolidation of IT resources and without the expense and limitations of proprietary technology. RHEV, an open source option, delivers datacenter virtualization by combining its centralized virtualization management system with the KVM hypervisor, which has emerged as a top hypervisor behind VMware. According to Red Hat, RHEV delivers 45% better consolidation capacity than its competitors according to a recent Spec 1 virtualization benchmark and brings architectural support for up to 4,096 processor cores and up to 64TB of memory in the host, 32 virtual CPUs in the guest, and 1TB of RAM. This exceeds the abilities of proprietary hypervisors for Linux and Windows. Red Hat also reports RHEV Virtualization Manager can enable savings of up to 80% relative to comparable proprietary virtualization products in the first year (initial acquisition cost) and up to 66% over a course of three years. Finally support for such security capabilities as multi-tenancy combined with its scalability make it a natural for cloud computing. Second, Red Hat introduced a platform-as-a-service (PaaS) initiative, called OpenShift, to simplify cloud development and deployment and reduce risk. It is aimed at open source developers and provides them with a flexible platform for developing cloud applications using a choice of development frameworks for Java, Python, PHP and Ruby, including Spring, Seam, Weld, CDI, Rails, Rack, Symfony, Zend Framework, Twisted, Django and Java EE. It is based on a cloud interoperability standard, Deltacloud, and promises to end PaaS lock-in, allowing developers to choose not only the languages and frameworks they use but the cloud provider upon which their application will run. By building on the Deltacloud cloud interoperability standard, OpenShift allows developers to run their applications on any supported Red Hat Certified Public Cloud Provider, eliminating the lock-in associated with first-generation PaaS vendors. In addition it brings the JBoss middleware services to the PaaS experience, such as the MongoDB services and other RHEL services. Third, Red Hat introduced CloudForms, a product for creating and managing IaaS in private and hybrid clouds. It allows users to create integrated clouds consisting of a variety of computing resources and still be portable across physical, virtual and cloud computing resources. CloudForms addresses key problems encountered in first-generation cloud products: the cost and complexity of virtual server sprawl, compliance nightmares and security concerns. What will make CloudForms of particular interest to heterogeneous mainframe shops is its ability to create hybrid clouds using existing computing resources: virtual servers from different vendors, such as Red Hat and VMware; different cloud vendors, such as IBM and Amazon; and conventional in-house or hosted physical servers, both racks and blades. This level of choice helps to eliminate lock-in and the need to undergo migration from physical to virtual servers in order to obtain the benefits of cloud. Open source is not generally a mainframe consideration, but open source looms large in the cloud. It may be time for System z shops to add some of Red Hat’s new technologies to their System z RHEL, virtualization, and cloud strategies as they move forward.